Two years ago I worked with a team that struggled with delivering feedback to each other. Team members would try to express something to either raise each others performance levels or to improve working relationships, but somehow something would always seem to go wrong and they ended up triggering each other. This damaged their productivity and morale to an extent that several people left the team. The remaining team members went through feedback training and coaching, and we looked at how the intentions behind feedback are the foundation for constructing constructive feedback. For example, feedback about performance and feedback about working relationships sound very different but the members of this team always used the same format. Quite similar to when teams use user story formats for non-story related work e.g. As a system I want to not run out of memory so I don’t crash. After feedback training, this team was even able to have very difficult conversations with each other about individual behaviors in a constructive way that strengthened their morale and productivity. The moral of the story is that when we aren’t aware of our intention and when we do not deliberately shape feedback accordingly we risk damaging our working relationships, individuals and teams performance levels, and peoples self-esteem which is the opposite of what we’re trying to achieve. Unfortunately, my experience of working with teams has shown me that we pass on feedback in the wrong format more often than at least I’d like us to. 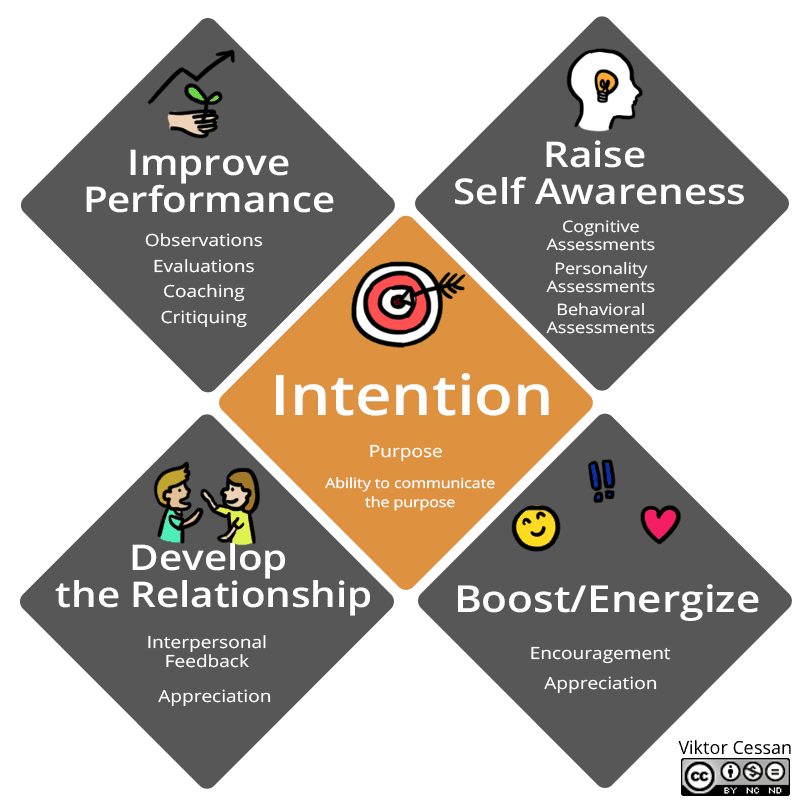 Below are nine common intentions that I’ve noticed that people try to pass on in the standard feedback format (“When you… I felt… And it affected me/us this way”) even though it might be a poor match. Below is a short quiz with some common statements. Can you guess the intention behind each statement? Note that some statements can have multiple intentions. The context does matter. If you found the quiz above difficult perhaps the model below will help you figure out what tool to use when. As an example, let's say one of your team members keeps interrupting you which frustrates you and you don't want to work with her. What tool would you use in that situation? Would you try to coach the person? What if she hasn't understood that this is a problem, or what if she doesn't want to be coached by you? Or would you try to appreciate her in the hopes that she understands that she should stop interrupting you? If anything it's more likely that you'll come across as passive aggressive trying to manipulate her behavior or the conversation. Note that criticism and complaints are not listed as intentions behind feedback because I don't consider them feedback. There's nothing constructive about them. Scrum master, Coaches, Consultants, and Managers - focus on behavior, not psyche! Many with leadership training sometimes think they know how the psyche works and evaluate people from a psychological standpoint, but unless you're trained for it (psychologist) and have permission to engage someone - don't. If delivering feedback is an area you want to improve in, one thing that Might be helpful to you is to verify your intentions the next time you're thinking of delivering feedback to someone. Perhaps your intention is not to improve your working relationship and some other format might be more suitable. P.s If you'd like to learn more about here are two other posts I've written about feedback. 7 Things to think about when it comes to feedback. & The importance of feedback in self managing organisations. Subscribe to my newsletter to download my Feedback Workbook and to start giving better feedback today with the EPIQ feedback model. One addition. Evaluation is another type commonly mistaken for interpersonal feedback. Evaluations are used to improve performance and help people grow so it belongs in the top left corner. However, none of the statements in the quiz were examples of evaluations. One clear way to recognize evaluations is if the conversation is about someone meeting, not living up to, or exceeding expectations. Really inspired to start following your posts. So far just heard of you from Kalle ???? I discovered that I need more training in this. Good one! And I “failed” miserably on the test. It is difficult to position the different kinds of statements that is used and disguised as feedback. The thing that strikes me is how often I see the three C’s (Critique, Criticism and Complaints) baked into a feedback “cinnamon bun” when it actually is pure bullying. So I took the quiz and I have a hard time understanding how certain pairs are different. Can you help me understand how you’re thinking about the differences? For example, Criticism and Critique. I’ve always thought of a critique as an instance of criticism. Is the implication that some forms of intention are negative? Critiques, in philosophy, are not necessarily a negative thing. For example, we used to be fond of saying in class “Make sure you are criticizing the idea not the person.” Which I thought of as a helpful distinction that allowed for psychological safety. Another pairing I confess having some confusion with is the difference before appreciation and praise. When I reflect on them it makes sense to me that appreciation can be a form of praise, but praise is not a form of appreciation. Can you help me distinguish criticism and critique, praise and appreciation a little better? When you are appreciating someone you’re letting them know that you valued/appreciated an action they took for or towards you. Thank you for bringing me coffee. Thank you for texting to see how I felt. Thank you for thinking of me. etc. When you are praising someone it does not have anything to do with you. They didn’t take any action for or towards you but you’re still showing your approval of their performance despite it not being requested. I do little praising and more encouraging. The difference between critiquing and criticism has to do with quality, empathy, and shared goal. If I asked you to review my work and you give objective feedback on my work e.g. missquoted source, misinterpreted data here, paragraph too long so you lose my interest etc, that’s in line with the goal I have and it’s performance feedback. If you criticise you place judgement or evaluation on top of that you might say – it was a boring article, you’re not great at drawing conclusions. There’s nothing constructive about it, it doesn’t help me improve my performance or article, and there’s no empathy towards me. Does that clarify how I reason about the differences? P.s. If you’d like to learn more about praise vs encouragement I recommend Carol Dwecks work on Growth Mindset.